The doors to the LA Auto Show opened to the press earlier this morning, with dozens of vehicles making their debuts of the next two days. One of those will be from Shelby, as the company announced yesterday that they will unveil their “newest high performance vehicle packing world-class power and handling.” Shelby isn’t saying specifically what that vehicle is, but judging from the covered car on the show floor we can definitely say it’s a Mustang. 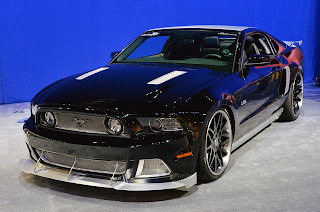 Shelby has introduced several new Mustangs during the auto show circuit this year, starting with the GT500 Super Snake Widebody in Detroit and followed up by the 2013 Shelby 1000 in New York. This is the first time in recent memory that the company has made a debut at the LA Auto Show. The Shelby press conference at the LA Auto Show is scheduled for 11:20 am PST tomorrow morning, and we’ll bring you all the details and photos of the new Mustang at that time. This entry was written by by Drew Phillips (Mustangs Daily) and posted here on Wednesday, November 20th, 2013 at 9:45 pm and is filed under la auto show, la auto show 2013, News, shelby. This article was not written by us, rather gathered using RSS feeds listed here. We take no credit for this article. You can leave a response, or trackback from your own site.